Bidean nam Bian is a fabulously complex mountain overlooking Glencoe. "The Three Sisters" form rocky terminations of ridges that separate Coire Gabhail ("The Lost Valley"), Coire nan Lochan and Coire nam Beith. All the glens and corries offer great possibilities for gully and face descents, with most of the Grade I and II lines having seen several descents. 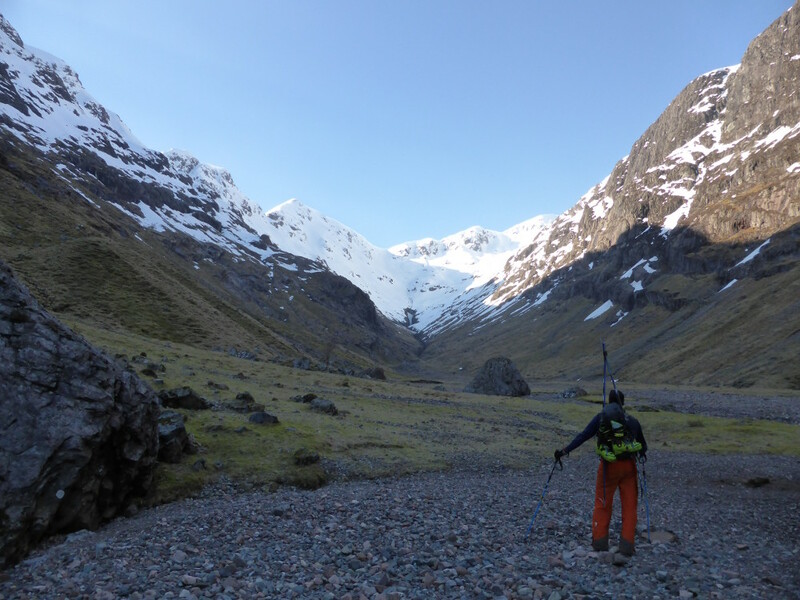 For the routes described, you can access either Coire Gabhail ("The Lost Valley") or Coire nan Lochan from the same sizeable car park, situated by the A82 opposite Gearr Aonach. There are bridges across the River Coe for each glen. For Coire Gabhail, once beyond the boulders that guard the entrance to the glen, you should stick to path on the right hand side of the gorge, and make a rising traverse towards the col between the summit of Bidean nam Bian and Stob Coire nan Lochan. This then offers a fine final ascent up a rocky ridge/fine snow arete, depending upon snow cover. There is one relevant Scottish Avalanche Information Service forecast for Bidean nam Bian. This line starts right on the summit of Bidean nam Bian, giving you the possibility of a big descent with suitable snow cover. In March 2014, it was possible to ski from the summit to the gorge in the Lost Valley, giving 700m of vertical descent. The face fills readily after South-Westerly storms, but be particularly aware of the avalanche risk, as the line begins with a convex start, followed by a descent into a large bowl. With good cover, you can ski anywhere on the face. Away from the obvious fall line from the summit, an optional short chute can be taken in on skiers left if you are needing your fix of gully skiing (it is very short!). This face is known as "Paradise" in the Glencoe offpiste guidebook. Notes: Allegedly a Grade I snow climb, but when banked up, it's not as steep as that. Broad Gully is as straightforward a descent as you could hope for in a graded gully ski. Wide (as the names suggests), and at quite an amenable angle, it provides a good introduction to gully skiing. It has the added advantage that is it clearly visible from the car park! Notes: Straightforward for the grade.